1.5mm, 2mm, 2.5mm, 3mm, 4mm, 5mm, 6mm, 8mm and 10mm. The keys are ideal for driving bolts and screws that have hexagonal sockets. They are made from silicon alloy, providing strength and wear resistance. The keys are precisely heat treated to ensure that, if overloaded, they will fail by twisting rather than breaking. This guarantees user safety. The set is supplied in a compact sleeve-case with a hinged flap for instant selection of the required size. It allows easy storage, whilst keeping the keys together. 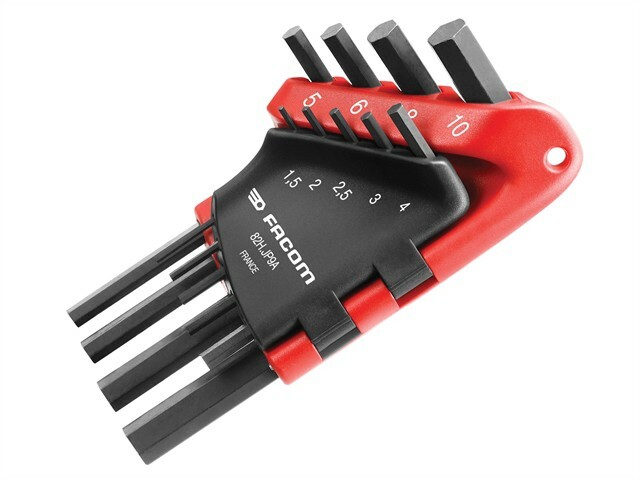 The secure fastening mechanism allows easy removal of a single hex key without moving the others. Resistant to chemicals and general wear and tear. Performance: Conform to NF/ISO 2936 and DIN ISO 2936.